In the holy city of Amritsar, you get to learn a lot about history, religion and god. The beautiful city is marked with many buildings of historical and national importance. In case you plan to visit Amritsar, I suggest you to go through the post once, Happy journey!!! This Harike Wetland is the largest wetland in northern India. It has a Harike lake in the deeper part of it. The wetland and the lake is manmade. The wetland spreads into the three districts of Amritsar, Kapurthala and Ferozpur. The wetland is biodiversely unique. Different species of snakes, turtle, amphibians, fishes and other invertebrates can be found. Birds such as Yellow-crowned Woodpecker, Brown-headed Gull, Eurasian Hobby, Striated Grass bird, Tufted Duck, Cetti’s Warbler, Brown Shrike etc. Indus dolphins are very common here. The place is rich in flora and fauna. Heritage walk is an amazing experience walking inside the narrow and bye lanes, showcasing the historical spots. The walk starts at 8 every morning and culminates at golden temple at 10 am. The heritage sites that are covered in the walk are Saragarhi Gurdwara, Quila Ahluwalia, Chowk Jalebiyan Wala, Akhara Sangalwala, Darshani Deori, Chaurasti Attari chowk, Radha Krishan Mandir, Crawling street, Puratan Rasta and concludes at Akhara Brahm Buta. For those who visit Amritsar, I suggest you should visit the Maharaja Ranjit Singh Stadium. It actually was the palace of Ranjit Singh, which was then transformed into museum in 1977. The wealth in the museum includes paintings, coins, miniatures, khalsa dresses and several weapons. It has lot to offer about the art, architecture and history of Sikhs of 18th and 19th century. The museum is open from Tuesday to Friday. Rambagh palace memorizes the capital of first Sikh ruler Maharaja Ranjit Singh. This garden was based upon the pattern of Shalimar Bagh of Lahore. It is spread over an area of 84 acres and has 14 feet high boundary wall. There is a fountain in the garden, which adds to the glory of garden. The museum talked above is situated in the premises of the garden. Ramtirath is located on the Amritsar lopoke road. The ancient pilgrimage centre is famous because of its association with the period of Ramayana. It is said that during the time of exile, Sita spent her time here. It was here, where she gave birth to twins who later came to be known as Luv and Kush. The place is a must visit especially during the time of diwali. A grand fair is held at the place. Also,there is a tank, believed to be dug by lord Hanumana. It is considered holy to dip in the tank. On the sides of tank, there are temples. The fair is glorified with entertainment rides and many stalls. This mosque is a historical one speaking the tales of freedom. It was built in 1876 by Mohammed Khairuddin. It is here where Tootie-e-Hind Shah Attaullah Bukhari raised voice against British rule. The place attracts a lot of people. Amritsar is not just a place of gurudwaras, but it has a lot for people from different religions as well. This famous Laxmi Nrayana Temple or Durgiana temple as called, is a repo0sitory of hindu scriptures. It was constructed by Harsai Mal Kapoor in 1908. It is known as silver temple because of its silver carved doors. Pandit Madan Mohan Malviya, one of the greatest reformers of India, laid its foundation stone. The bagh relates back to history, where 2000 Indians, who had gathered for a peaceful public meeting were killed by britishers under the command of General Michael O” Dyre on 13th April, 1919. “The impossible men of India shall rise and liberate their mother land”, said Mahatma Gandhi, after the Jallian Wala massacre. There is a section of wall with marks of bullets still visible. Wagah is the only cross border between India and Pakistan. It is known especially for the wagah ceremony, which is held each day before 5pm. The ceremony addressed as “beating the retreat ceremony.”soldiers from both the countries perform and bring up their respective national flags. We all know the famous golden temple or Harmander Sahib. The spot is one of the most sacred pilgrims for the Sikhs. The harmander sahib has four doors, which symbolize entry of people of all religions is unrestricted. The Guru Granth Sahib, the holy books of Sikhs, is always present inside the gurudwara. It is built with approximately 400 kg of gold leaf. The gurudwara offers Guru ka Lanagr(free food) to approximately 20000 people every day. 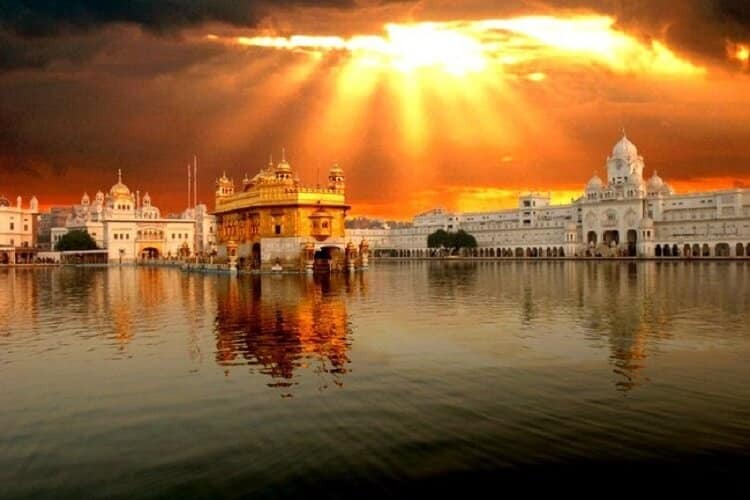 Apart from this the golden temple premises has palces where they can seek bleesings, such as the Akal takht, har ki pauri, jujube tree, Gurudwara Ilachi Ber, Ath Sath Tirath, Bunga Baba Deep Singh, Thara Sahib and Ber Baba Budha Ji.